We’ve seen our fair share of Pinterest clones in the past month, from the most blatant copycat sites that make no effort to disguise what they’re doing, to the sites that are aiming for an even more niche audience than Pinterest itself. Then there are sites like Sworly, which at first glance look an awful lot like Pinterest and function an awful lot like Pinterest, but bring enough of a difference to the table to warrant a closer look. Rather than encourage users to create interesting collections of images, Sworly brings the Pinterest approach to sharing music. After logging in with Facebook (yes there’s annoyingly no other choice) you can start to add songs to Sworly if they haven’t already been added. At first glance, the ‘Add song’ feature is a little confusing, but it’s actually quite easy to use. Simply enter the artist name and song you want to share, and Sworly will automatically find the best video for you. Add optional tags and a description and post it to your profile. 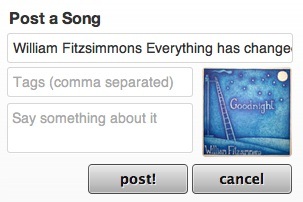 The song will show up on the public feed and on your profile. Songs that have already been shared on Sworly can be reposted and liked, and of course, as you would expect of any social network, you can comment on posts, and follow other users. There is currently no way to delete a song from your profile. 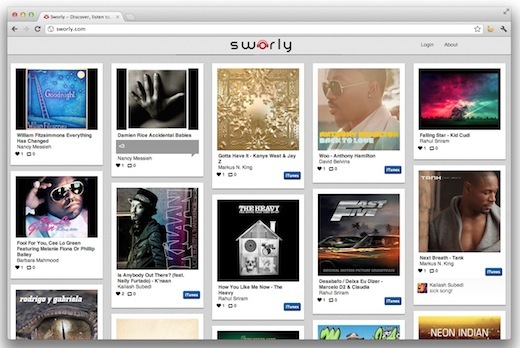 Right now, in its current state, Sworly offers users a great way to create a huge YouTube-powered music library. If the song is on YouTube, Sworly will find it for you. That doesn’t mean there aren’t a couple of features we’d love to see on the site. Sworly has already put itself in the Pinterest-clone category, so it might as well just go all the way by letting users create collections or playlists, a-la-Pinterest boards. You don’t want to listen to all of your music all the time. Any music site worth its salt has to offer some sort of playlist option, with continuous play. At the moment on Sworly, you have to hit the play button for each and every song if you want to listen to it, making it a little inconvenient. Sworly shouldn’t just stop there with the ‘Pinspiration’. With the introduction of playlists, users should also be able to follow individual lists rather than every single song a user shares. Sworly is one of those sites which could be on to a great thing, but definitely needs a tweak or two to get it there. It’s also a great reminder that cloning an existing concept doesn’t always have to be seen in a negative light. Sure you can share YouTube videos on Pinterest as well, but that’s not what the community is focused on. Sworly, on the other hand, makes it all about the music. What do you think of Sworly? Let us know in the comments.